We take a comprehensive, proactive approach to safeguard the communities where we live and work. 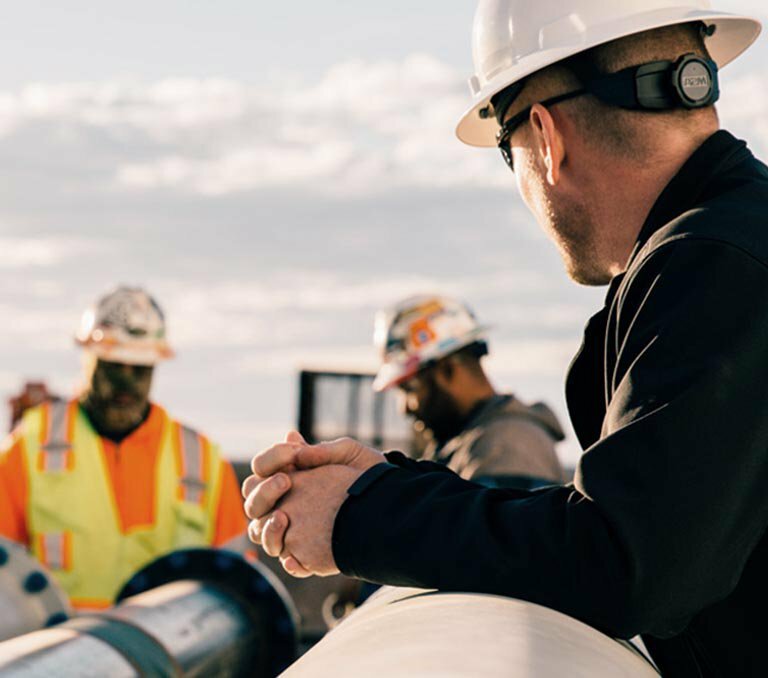 EnLink Midstream invests substantial human and financial capital in efforts to ensure our systems’ integrity and, by extension, the safety of both our employees and the general public. We feel the best emergency response system begins with prevention and continuous monitoring. However, in the event of an emergency, we implement well-defined and proven response plans. What do EnLink’s emergency response plans cover for natural gas and liquids pipelines? Our plans outline the steps to be taken in the event of a fire, rupture, major leak, or any other serious incident occurring at or near one of our facilities. These plans have been developed both to support our employees, contractors, and local emergency response personnel in their handling of emergency situations involving our facilities and to protect the public. What does EnLink Midstream do in response to a pipeline emergency? In the event of an emergency, our main concern is the safety of the community and the response team. Our personnel works with the appropriate public safety officials and emergency responders to determine necessary steps to protect both life and property. Contacting public safety officials and emergency responders. Locating and isolating the emergency site. Shutting off and containing the flow of the product. Assembling a team of experts from various divisions of our company to address the emergency. The examination of any property damage resulting from the incident. The implementation of industry best practices for preserving the integrity of the incident site. Close collaboration with local, state, and federal agencies to determine the cause of the incident and take appropriate remedial measures. As part of our comprehensive safety program, we communicate safety information to the communities adjacent to our pipelines. Our means of communication include public awareness meetings, call-before-you-dig programs, and clear and visible pipeline markers. EnLink works closely with emergency response personnel to develop response plans in the event of an incident occurring at or near one of our pipelines or facilities. These response plans are designed to prepare our employees to handle emergency situations involving our facilities. Communication and cooperation with local organizations are key components of these emergency response plans. To that end, EnLink’s field locations regularly hold meetings with emergency responders to educate them on our operations. Evacuate the area and restrict entry to trained emergency response personnel and designated operator personnel. Establish isolation zones based only on measurements from combustible gas indicator instruments. Odor or lack of odor is not sufficient for the establishment of safe zones. Avoid creating sparks. Potential ignition sources for natural gas include electrical motors, firearms, static electricity, non-explosion-proof flashlights or tools, and any open flame or spark. Do not light a match, start an engine, use a telephone, switch lights on or off, or do anything that may create a spark. Immediately make the operator aware of the situation. Check the posted right-of-way or station signs to find out which company operates the pipeline and how to contact the operator. Let the escaping product burn if it is on fire. Attempting to extinguish a fire may result in a secondary explosion. If necessary, provide cooling for nearby buildings, equipment, or structures that are exposed to and may be threatened by the fire. Only allow designated personnel to operate the valves to shut off the escaping product. Do not operate the valves yourself. Avoid forced ventilation of structures and excavations. Forced ventilation may increase the possibility of a flammable atmosphere. EnLink expects all contractors to follow its guidelines to promote safety. In addition to complying with all applicable laws and regulations, our Environment, Health and Safety Manual outlines the requirements that contractors must follow to work for EnLink. The manual is provided to contractors prior to the start of a project, and these policies are enforced during the course of all contract work. Do You Have a Digging Project Coming Up? Call 811 at least 48 hours in advance of breaking ground on any digging project. Doing so will help prevent the disturbance or breaching of any existing underground utility lines. In fact, state law requires contractors and homeowners to call their local one-call center by dialing 811 to have the location of underground utilities marked before starting an excavation project. Visit https://www.safeexcavator.com/enlink to learn more about safe digging. IN THE EVENT OF AN EMERGENCY, IMMEDIATELY CALL 911 AND NOTIFY ENLINK. EnLink maintains 24-hour phone banks for gas control and emergency reporting. In Alabama, Kentucky, Louisiana, Mississippi, Ohio, and West Virginia: call 866-394-9839. In Oklahoma, New Mexico, and Texas: call 877-593-0822.